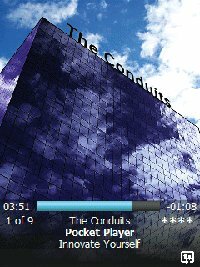 Conduits Technologies has just rolled out its spanking new Pocket Player 3.51 for Windows Mobile, naturally targeting owners who have smartphones running on the Windows Mobile platform. The Pocket Player has but one aim in life – to satisfy consumers who demand more from a media player experience. The media library boasts touch-scrolling ability for easy navigation, full screen album artwork for the curious, universal Plug and Play support, podcast support, radio streaming as well as user ratings. Pocket Player ought to be pretty functional considering it came up tops in the Audio category at the 2007 Smartphone and Pocket PC Magazine Best Software Awards. Pocket Player 3.51 comes with a media browser that enables users to browse by song, artist, album, genre, or release date. This browser catalog will be updated automatically whenever files are added or removed – and if you decide to throw a memory card into the fray, expect to be able to manage thousands of tracks as well. Touchscreen devices will see simple finger gestures navigate the browser list, where a quick swipe will allow you to scroll through the list items. A simple tap stops the motion so the user will be able to select the desired item. Interested parties will be able to check out the Pocket Player here with a 30-day trial being made available. If you’re extremely happy with what you get, then you can always pony up $19.95 for the full version of the Pocket Player 3.51. This kind of software is definitely welcome, but I’m not too sure it will be able to take over the place of an iPod or a dedicated portable media player. After all, despite all the functions crammed into smartphones these days, most folks still use it for the most basic communication purposes, including voice calls, text messages and e-mails. Music and video playback is but an afterthought, whereby a dedicated portable media player would by far do a much better job compared to this interim solution.